Scott tells Charlene if they get married their parents will have to approve of their relationship; it will be legal and they will be responsible. Charlene is shocked and asks Scott if he really means it. Scott says he knows it is a big commitment but he thinks he is ready for it. Charlene says she needs time to think about it and Scott walks away disheartened. She calls him back and says she's thought about it already – her answer is yes. Henry is still searching for the ring when Madge turns up with some lunch for him. Henry says he will find the ring and thinks Madge should keep it even though she and Harold are no longer engaged. Madge says she wants to stop feeling guilty about the ring and all she wants is to clear her debts. Henry is sure that she still wants to marry Harold. 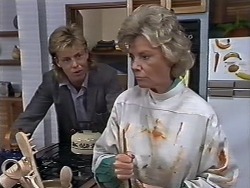 Helen is painting when Lucy comes in. She doesn't like Helens painting and thinks she should use more bright colours! Lucy is bored; she couldn't go swimming with her friends because she has an ear infection. Helen suggests she takes Bouncer for a walk. 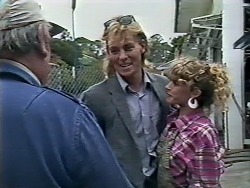 Scott arrives and tells Helen that he and Charlene are getting married. Helen is stunned. Scott tells her the chat they had about marriage prompted him to propose. Helen hugs Scott and tells him how pleased she is for him. Rob is complaining about his ham roll – he says its stale. Mike insists it was fresh in from the bakery this morning. Jim arrives and he and Rob start talking about the garage. Rob comments that he saw Scott earlier and starts talking about the ‘big event'. The wires clearly crossed, Rob says the news must have come as a shock to Jim. Jim says Scott had a crazy idea in his head and now it's all forgotten about. 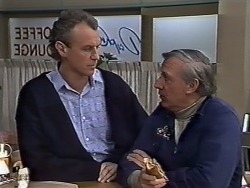 As Jim leaves, Rob tells Mike it's terrible that Jim is happy about Paul and Gail's engagement but not Scott and Charlene's. 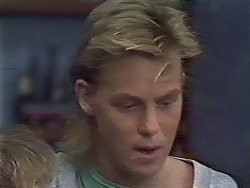 Mike is shocked to hear Scott and Charlene are engaged. Scott is on the phone to Jim's office as he desperately wants to tell him the news. Helen is apprehensive and wonders what Jim's reaction will be. Scott is sure there will be no problem as this time he and Charlene are being responsible. He asks Helen if she thinks Jim would allow he and Charlene to move in after the wedding. Helen says she wouldn't mind but is not sure Jim will feel the same way. Madge comes homes and is clearly tired. She sits upright and when Scott and Charlene burst through the door she tells them she is meditating! Charlene tells Madge she and Scott are getting married. Madge assumes Charlene is pregnant. Charlene assures her she is not and says she and Scott just want to be together. Madge is on the verge of tears and thinks they are far too young to get married however if it's really what they want she is happy for them. She and Charlene hug amongst the tears. Lucy is walking Bouncer and asks Henry if he needs any help. Bouncer starts sniffing through the rubbish and finds a bone. Lucy decides she will keep it and tells Henry it's probably from a dinosaur! Scott and Charlene arrive and work their way to telling Mike their news. Mike is peeved that they told Rob before they told him and tells them he thinks they are crazy. He says they are too young to get married and quotes divorce statistics! Scott and Charlene are hurt and leave The Coffee Shop saying they will look for a new best man. Bouncer continues to sniff amongst the rubbish and is playing with a can. It rattles and the ring falls out. Henry says Madge will be stocked. Helen and Madge are talking about the wedding – they are both excited and think Scott and Charlene are being responsible. Henry and Lucy arrive and present Madge with the ring, she is ecstatic and says that's another piece of good news. Henry asks what she means and she tells him that Scott and Charlene are getting married. Jim and Rob are looking at No 13. 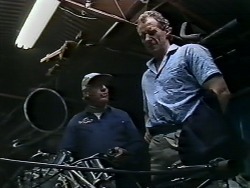 Rob says the car isn't ready for a test run yet but Jim is eager to take the car out. Rob is concerned that Jim is starting to sound like Jeremy. Rob makes another comment about the wedding and says Jim's got a good deal, as he won't have to pay for either wedding. Jim is shocked and Rob digs the hole a little deeper and announces that Scott and Charlene are engaged! Henry is voicing concerns over the wedding. He is worried about Charlene and doesn't want her to go through marriage troubles like Madge did. However he is sure Charlene would get through anything, just like Madge does. He says she's a true Aussie battler and would even survive if she were dropped in the pacific without a life jacket! Henry cleans up the ring and tells Madge to make it up with Harold. Scott and Charlene are waiting for Jim to come home. They tell Helen about Mike's reaction and Scott tells her how upset he is about it. Jim arrives home and tells them he already knows about the wedding. He says they should have spoken to him before they made any decisions. Jim says it's an insane idea. 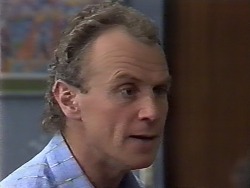 Scott gets angry and tells him he and Charlene are getting married no matter what. Jim tells them they can do what they like but he won't be at the wedding.